Before Washington was a state. Before the hotels of Seattle sprung to glory, and as the lodging of Portland faded from interest of America’s wealthy, the grandest of hotels in United States Northwest was the Tacoma Hotel. It took up an entire block and was frequented by famous entertainers and U.S. Presidents. Far and wide, it was regarded as the center of luxury in a newly unified Tacoma. Surrounded by rough streets and tough men, the Tacoma overlooked the water of Puget Sound’s Commencement Bay. This center of luxury and City of Destiny are a bit different than modern Tacoma. Through what could be chalked to vivid imagination, collective illusion, or more powerful magic, we’ve managed to find our way back to the late-19th century. However it has happened, we are walking the streets of Tacoma, Washington Territory reminiscent of the ones seen in black and white photos. Among the stevedores, longshoremen, lumberjacks, and robber barons, one large gentleman stands out. There are horses in the streets, brick on the walks, and rough barges in Commencement Bay. This isn’t our Tacoma, but a Tacoma of a bygone era of steam, soot, and lumber. Train whistles and shipping horns blast an irregular rhythm. There is a bear walking the street! No one else gives the 700-pound brown bear more than a nod in greeting. He moves with a purpose and thirstful desire. This ambling brute has a collar, but we dare not get close enough to inspect it. Braver souls than us, natural to the time, walk over and ruffle the fur at the neck and behind his ears. “G’dday Jack,” a passerby lifts his cap in greet, to a bear? Crossing the street, the creature walks into a saloon. Without much more than a nod, the barkeep pours one large mug of beer and sets it on the far end of the bar. And the bear rises on two feet as it walks over to the barstool with the mug in his clawed grasp. Jack – we shall call this bear Jack because everyone else seems to – lifts his mug and starts drinking. He defies all conventions we know about bears. This Jack is friendly, warm to the touch (one of us is finally brave enough to give him a pat), and a seasoned beer drinker. We order the same brew in the same mug as Jack. He inspires us. Now he’s done with his beer. He carefully sets the mug down and ambles out of the saloon. His time at the bar is done. Where does a beer drinking bear go next? Following the massive animal through the streets of Tacoma, we round a corner and stand in awe of the massive Tacoma Hotel. Jack walks through a corridor, ambling past a veranda, and into an open space that could be called a private park. It has a pen with a tub, a large post with a platform on top, a hut, and a water pipe. Out front is a wheelbarrow that Jack carefully avoids. In that barrow sits a highball glass and an empty bottle of soda. There’s a clay jug as well. Jack stares at it with a wistful glance. To one side of this park is a view of a bustling port, and to the other, the famous hotel. Some of the bellhops and servants have fine china. There are magnificent hats and dresses. Dirt floors and rough wood walls surround the pen. The short fence is easy for Jack to climb. He seems at home in his pen and finds his collar with chain, loops it over his head, and applause starts. There is a small crowd that are happy to watch this nearly human bear re-confine itself. This crowd ignores us. We are mere shadows in the presence of Jack. Everyone is a shadow in the presence of Jack, and no one ignores a bear like him. And a man walks up to the wheelbarrow in front of the bear shaking his head. The crowd roars, mimicking Jack’s guttural grunt. These residents and bellhops, caretakers, and city folk love Jack the Drinking Bear. He’s as much one of them as anyone else, whether fancy or poor. People come to see Jack not just as curiosity. They see him because he is Tacoma. Like the combination of New Tacoma and Tacoma City, Jack is part one thing (bear) and part another (friend). In the most opulent part of unified Tacoma is this unconventional bear. Jack isn’t just a bear. He’s one of us – strong, defiant of convention, and a symbol of booming Tacoma. This is Jack. He is Tacoma’s bear. Living at one of the wonders of the west: The Tacoma Hotel, he is an icon and an enigma. He also bears the title of largest drinking buddy anyone could ask for. Our shared memory of this sensational creature still runs in the spirit of Tacoma and unites us as we enjoy a cold one at Eleven Eleven, Hanks, Devil’s Reef, Top of Tacoma, Parkway Tavern, Rhein Haus, and more. 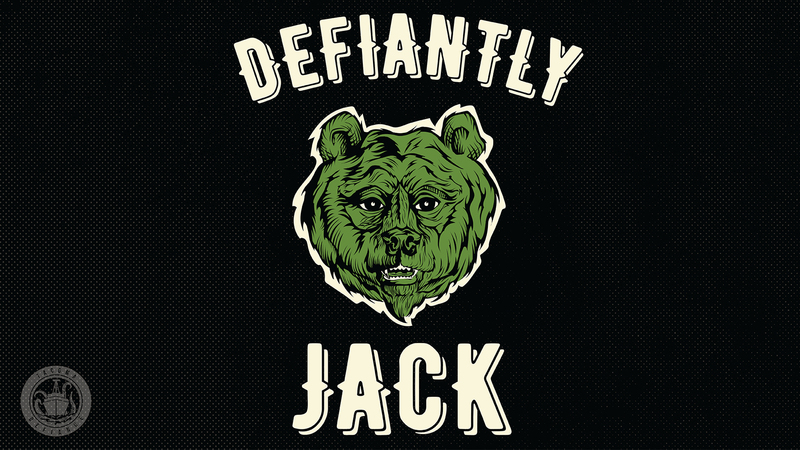 Our evening escapades serve as tribute and honor the memory of Jack the Drinking Bear and his Defiantly Tacoma spirit. No longer will Jack’s memory be held by a few nostalgic Tacomans. We are inviting you to our next tribute to a beer-loving beast who called Pacific Avenue home. It is a Day of Defiance. Join us on May 12 as we celebrate the spirit of Tacoma’s rich history and Jack the Drinking Bear. Defiantly Tacoma. Defiantly Jack.